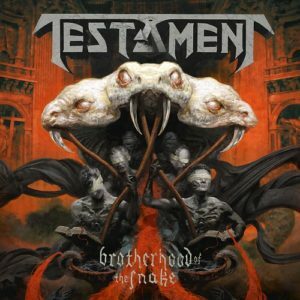 Before I get into Testament’s album, I’ve got to acknowledge the fact that it’s been a long time since I’ve written a new post! This has truly been a busy year, but of course my love for all things rock and metal is as strong as ever. We’ve also had a lot of great albums released lately, so there’s plenty to talk about. Without further ado, let’s start digging into one of them! It’s been 4 years since the band released Dark Roots of Earth, their second second studio album after their post reunion era. And now we’ve got the third, overall eleventh, with Brotherhood of the Snake. It has been a long wait, but I think it was worth it! There are major differences between the previous two releases and this one, but the band has once again delivered a no-nonsense thrash metal record with a lot of memorable riffs, vocal lines and some spectacular drumming from none other than Gene “the Atomic Clock” Hoglan. Testament is a well-known thrash metal band. They were formed in 1983 – roughly around the same time as the bands that came to be known as the Big 4: Megadeth, Metallica, Anthrax, and Slayer. To be fair, the Big 4 term was coined by music journalists at the time, not by those bands themselves. And they frequently say in interviews that bands like Testament, Exodus, and Overkill all deserve to be recognized as much as they are. After all, they are all from the same era, they all contributed significantly to what we now know as thrash metal. But no matter how you look at it, the fact of the matter is that the Big 4 has historically received a lot more attention than any other thrash band. And as much as I absolutely love every Big 4 band, I’ve always thought that Testament was a band that deserved equal recognition and praise because of their impressive roster of albums, the high caliber of musicians past and present, and a relentless dedication to this heavy music we’ve all come to love. Speaking of musicians, one notable line-up change from the previous record is the departure of long-time bassist Greg Christian, who was replaced by another incredible bass player, Steve DiGiorgio. I won’t go into detail about Greg’s departure because I’d like to focus on the music. But let’s just say that it was another monetary dispute among band members. And to be honest, we see this with many bands. When certain members (in this case Peterson and Billy) come up with most of the songs and they’re the ones shouldering most of the burden, you can’t expect every member to be paid the same. Especially if there hasn’t been a consistency in the line-up since the formation of a band. So, in the end, there’s bound to be some disputes when parties can’t come to an agreement. Some are made public, some remain private. It’s unfortunate because we don’t like to think of our favorite bands as businesses, but it’s called “music business” for a reason. If you want to read more on Greg’s departure, check out some of the links at the end of this article. All right, let’s get back to music! The songwriting on this album is dominated by the Billy/Peterson duo, which is completely natural since these two have been the driving force of the band since the late ‘90s. Alex Skolnick, the band’s long-time lead guitar player, normally contributes a significant amount in songwriting, but on this one, there’s only two songs where he gets writing credit (“Neptune’s Spear” and “Canna-Business”). To be honest, I didn’t think he was going to have any credit based on some interview I’d read with the band, but I’m happy to see he has contributed. The lyrical content is a little less political than the previous albums. Chuck Billy says that was a request from Eric Peterson as he wanted to have “cool” lyrics that would work well with the slightly more aggressive vibe of the album. Billy says he complied and the result is on the album. To be honest, I prefer the more politically/socially charged Testament as they’ve written some great songs in that area – but I can see where Peterson was coming from. They were shooting for a “The Gathering” (1999) vibe and the lyrics on that album are also not really political. The music overall is definitely in the vibe of The Gathering, in the sense that the band focuses on delivering a straighforward thrash metal album while dialing back on the melodic side of things. The album opens with the title track and from the get go, the band makes their intentions loud and clear. This record is going to be fast and heavy! It’s been mentioned many times in various interviews already, but the band intentionally wanted more of The Gathering vibe and you can clearly tell just by the opening track alone. It’s one of my favorites on the album! Then we’ve got other gems like “The Pale King” with an incredible opening riff, and then with the main riff kicking things into high gear in an unmistakable Testament style! It’s a straightforward thrash song but with a lot of melody thrown in there. I like the cool harmonies and arpeggios you hear during the track. And around the 2:40 mark Peterson brings out another intricate Testament riffs full of rapid hammer-on and pull-offs. The last solo is awesome as is the rhythm track behind it. Other highlights for me were “Neptune’s Spear” with some amazing melodic lead playing towards the end of the song. My guess is that’s the part Alex Skolnick wrote – it just sounds like him to my ears and it sounds so good! Reminds me of early Testament. 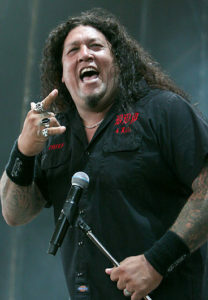 And “Born in a Rut”, with a great opening as well as one of the best Chuck Billy performances that you will ever hear! There’s a part that starts with “I really don’t give a damn” and I promise you, you’ll be amazed to hear! Chuck Billy is the rare metal vocalist who can do harsh and clean vocals equally perfectly. But my absolute favorite track on the record is “Centuries of Suffering”. Cannot say enough good things about it! The main riff is one of those fast-paced, intricate Eric Peterson riffs, and Chuck Billy’s vocals, especially on the chorus, will just make you stop whatever it is you’re doing and take notice! It is just so, so good, and a great example of the modern Testament sound. To me, this album is another great Testament record. I’ve come to expect intricate riffs, great drumming, some melody, and a variety of vocal styles from Chuck Billy. We have all of that on Brotherhood of the Snake. I still prefer the previous albums to this because I like it when Testament infuses a little more melody in their songwriting – but I just take this album as its own and appreciate the more aggressive nature of it. I guess the one area where I wish they’d taken a different route is the mix. This album, like the previous one, was mixed by Andy Sneap. No disrespect to the man – he’s worked with so many bands including Accept, Megadeth, and Exodus – and the albums he works on tend to do really well. My one complaint, however, is that every album he mixes tends to sound similar, if not the same! No difference here. In particular, the drums sound generic. Gene Hoglan played greatly; he’s arguably one of the best metal drummers out there but Sneap managed to make him sound the same as every other drummer he’s produced. Sneap’s a great guy and has a great reputation in the industry and he helped a lot of bands re-launch their careers, but I just don’t get the big deal with his production. I think the bands who work with him lose a little bit of their authenticity and I hate to see that happen to Testament as well. If you watch interviews done with Eric or Chuck, you will get the sense that this was an extremely stressful album to record. The band was busy with tours, and in the end, they had to just book studio time and force themselves to complete the album even before all song ideas were ready. Chuck Billy says he doesn’t want to record an album like this again. But I think in the end, they delivered a solid metal record that is undeniably Testament, but it’s also different in the songwriting department from the previous records and gives us something new to embrace from this talented group.